They say they want to let politicians know how it feels to have unwelcome machinery on your land. 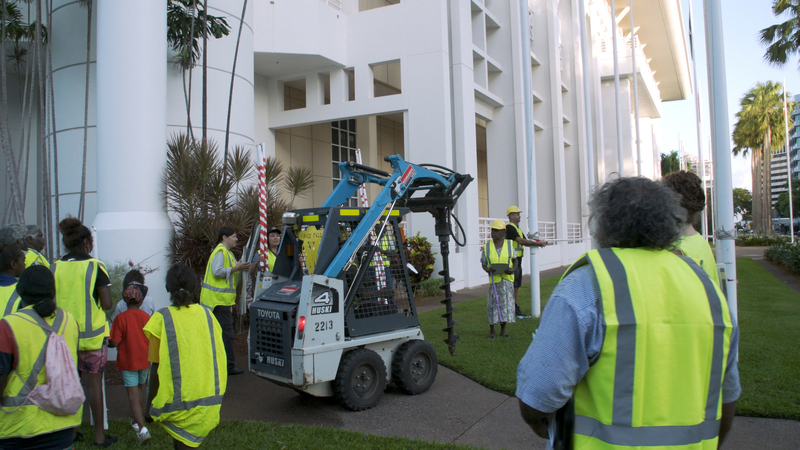 Traditional owners protesting fracking in the Northern Territory have brought drilling equipment to the front lawns of the Northern Territory’s parliament. They say they want to let politicians know how it feels to have unwelcome machinery on your land, and that they have not given their consent for gas companies to undertake exploration on their country. Wednesday marks one year since the Northern Territory government lifted the moratorium on fracking. The moratorium was announced in 2016, shortly after the Labor government took office. Fracking — shorthand for hydraulic fracturing — involves injecting fluid into underground rock at a high pressure to open cracks and force the release of gas. Conrad Rory, a 32-year-old Borroloola resident, told BuzzFeed News the protest aimed to show politicians how fracking exploration would affect Aboriginal communities. “We’re trying to protect our country and protect our water,” he said. 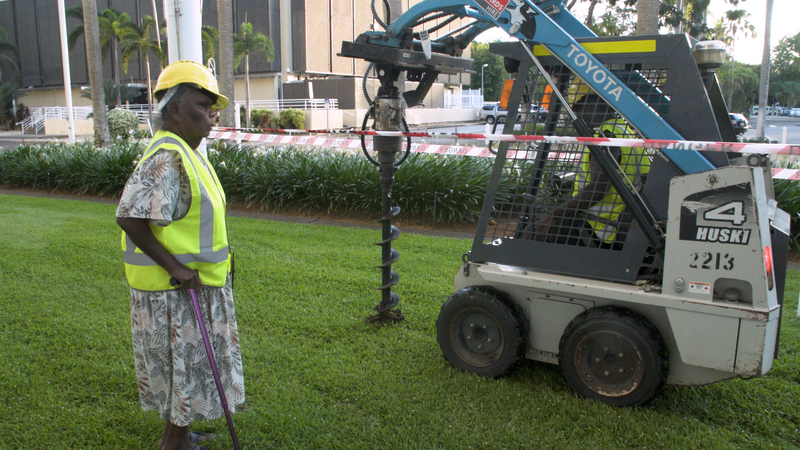 Rory sat in the seat of the mini-bulldozer as the group cordoned off an area of the grass and began to drill. Rory said he fears that fracking could contaminate water and animals, ultimately leading to Aboriginal communities being moved to urban centres like Darwin and Alice Springs. The decision to lift the fracking ban followed a 15-month scientific inquiry chaired by Justice Rachel Pepper. The final report did not make a recommendation either way about lifting or keeping the fracking ban. However, it said that if its 135 recommendations were adopted the risks of fracking could be reduced to acceptable levels. Chief minister Michael Gunner has said that all recommendations will be implemented. Conrad Rory sits in the mini-bulldozer. Rory said the report is “based on predictions and assumptions” that he does not trust. The report noted that there was “strong antipathy” for fracking during consultations. The “overwhelming consensus” of a “significant majority” of inquiry participants was that fracking “is not safe, is not trusted and is not wanted”, the report said. In 2017, the federal government placed pressure on the NT government to open up fracking, threatening to shake up GST distribution for jurisdictions that limited the practice. The federal government announced the NT would get $260 million extra in GST and $550 million for remote housing several days after the moratorium was lifted. Both governments have denied the funding was linked to the lifted ban, but then treasurer Scott Morrison’s letter offering the NT the GST increase referred to the decision.